The Affordable Care Act, quantified. Last week, the U.S. Department of Health and Human Services released a dataset of state-level Obamacare metrics. The dataset is divided into five main categories: coverage gains, employer coverage, individual market coverage, Medicaid, and Medicare. Between 2010 and 2015, the proportion of Nevadans without health insurance dropped from 22.6% to 12.3% — the largest percentage-point decrease of any state. (In 2015, an estimated 17.1% of Texans still didn’t have health insurance, the highest rate of any state that year.) The metrics come from various sources, including the Census, academic studies, and the department’s own estimates. Needle exchange programs in Russia...currently receive almost no funding. Until 2009, needle exchange programs had been widely available, mostly with financing from the Global Fund, a public-private consortium that is the world’s largest financier of HIV projects. But when that agency’s money was withdrawn in 2010 — largely because Russia had achieved the status of a high-income country — Moscow did not replace funding, and the number of needle exchanges in the country dropped from 80 to 10. This perspective — which paints the problem as a foreign-imported plot — is inflamed to build support for the government. To HIV prevention specialists, this is not exactly news; in fact, I featured a piece on the same topic by the BBC a year and a half ago. But I was pleased to see it featured in a high-profile publication. I was very interested to see that the pace of increase of new infections is strikingly similar to that of South Korea's new HIV infections, and the government response shares a lot of features with Russia's, including a lack of interest in evidence-based prevention strategies and socially conservative views that promote the idea that infection is the result of moral degeneracy. As a kid, I was always salty that my birthday fell so close to (and occasionally on) Thanksgiving that most of my friends and classmates would forget about it. Of course, it's amusing now to reflect on the fact that my nine-year-old self's biggest worry was whether her nine-year-old friends would remember her birthday, rather than whether my beloved country will regress into authoritarianism. But I digress. Rear Admiral Grace Hopper...was a major figure in the development of fundamental computing systems. She worked on some of the earliest computers ever made, like the Mark I, programming and performing research alongside the likes of Howard Aiken and John von Neumann. She aided in the construction of UNIVAC and created the first working compiler. If she had retired then, in 1952, she would already be considered a critical part of the development of the modern computer. But she continued her work, under public and private auspices, leading to the creation of many of what could be considered the first modern programming languages (you see the COBOL book in her hand above) and helping the Navy standardize and modernize its computing infrastructure. She’s even credited with popularizing, if not inventing, the modern definition of “debugging” after a moth was found in Harvard’s Mark II computer. Margaret Hamilton...was tapped to work with the Apollo program, creating the mission’s onboard flight systems. Apollo 11 ran her software, and at a critical moment during the lunar landing demonstrated its reliability — and also the importance of good documentation — when it activated alarms related to receiving more input than it could handle. The astronauts and mission control recognized that these errors in particular were something a computer could handle, though — the program prioritized critical systems, as it was designed to do, instead of shutting down or delaying calculations, and the landing was accomplished successfully. Hamilton has continued working on software engineering — she coined the term, by the way — in the private sector ever since. Alas, the bad: While I have been relatively impressed with Vox's data reporting over the last few months, I was disappointed to see this piece today, which suggested a causative element in the correlation between opioid use and Trump-voting with the unfortunate subheading declaring, "Another potential explanation for Trump’s surprising win." Methinks Vox needs to start reading XKCD. The site, called Professor Watchlist, is not without precedent -- predecessors include the now-defunct NoIndoctrination.org, which logged accounts of alleged bias in the classroom. There's also David Horowitz's 2006 book, The Professors: The 101 Most Dangerous Academics in America. But such efforts arguably have new meaning in an era of talk about registering certain social groups and concerns about free speech. "Expose" them for what, exactly - expressing their views? On a more mischievous note, perhaps it will enable me to find additional inspiration to start seriously looking for Ph.D. programs, so I can eventually make it into that registry. Happy birthday, indeed. Hate crimes in the United States. Since the 1990s, the FBI has collected data on hate crimes from local law enforcement agencies. On Monday, the bureau released data for 2015, reporting “5,850 criminal incidents and 6,885 related offenses, as being motivated by bias toward race, ethnicity, ancestry, religion, sexual orientation, disability, gender, and gender identity.” Those numbers are based on reports from 14,997 participating agencies. On the FBI’s website, you can view and download summary tables of the most recent data. You can also download incident-specific data for 1992 through 2014 from the National Archive of Criminal Justice Data. Unfortunately, as ProPublica noted yesterday, the FBI dataset is “deeply flawed”; more than 3,000 law enforcement agencies don’t participate in the program. It is too early to say definitively that hate crimes are in fact on the rise, but there is reason to be concerned. The analysis of the aforementioned data showed that hate crimes against Muslims rose by about 6% last year, and two other groups that collect data on hate crimes, the Southern Poverty Law Center and the Council on American Islamic Relations, have noted a spike in reported hate crimes during election week and in the days since. Reports of a 46% increase hate crimes in post-Brexit UK certainly don't make anybody feel better, either. Fake news on Facebook. Last month, colleagues at BuzzFeed News and I analyzed and fact-checked 1,000+ posts from hyperpartisan Facebook pages, and found a disturbingly high rate of fake news. Here’s the data. Facebook CEO Mark Zuckerberg has dismissed the possibility that fake news influenced the election, calling it a “pretty crazy idea”. Meanwhile, renegade Facebook employees have now formed an unofficial task force to battle fake news on the platform. There was more than a little hubbub about Facebook's role (or lack thereof) in driving the election by reinforcing people's self-constructed information bubbles. I personally think the more important ethical question is whether Facebook has a responsibility to do something about it by correcting its users' bad habits driven by the very natural (despite also being very unfortunate) human tendency toward confirmation bias. But I think it is also worth noting that the tendency toward that bias may have been exacerbated by the media's own self-constructed bubble. I don't have a whole lot of optimism that the polarization of this country, or the tendency of its citizens to only accept information that confirms what they already believe. But on the bright side, at least analysts and the media are paying closer attention now. Medicare beneficiaries. The U.S. government’s Medicare Health Outcomes Survey tracks the “physical and mental health and well-being” of Americans covered by Medicare. Each survey, currently available for 1998–2000 to 2012–2014, follows a sample of Medicare beneficiaries for two years, and asks them questions along the lines of, “In the past 12 months, have you had a problem with balance or walking?” The 2012–2014 data includes (at least partial) responses from 296,320 people. This now marks the second year in a row I haven't done anything fun for Halloween. This is not because I don't like Halloween or have some kind of personal or ethical objection to it, but rather because I have attended the Annual Meeting of the American Public Health Association, which has fallen on Halloween for the last two years. I always know it will be busy, and yet I consistently underestimate how much energy the conference will take out of me as an introvert going into extreme networking and advocacy mode for four straight days. When I called my mother on the last day of the conference (because it was her birthday), she asked me how I know whether or not these types of conferences are a worthwhile investment (since I don't go as a function of my day job and thus pay for them out of pocket), and I gave her a sort of canned response that networking and meeting people and getting noticed can turn into potential employment or collaboration opportunities in the future. Which is not untrue per se, but I think that the real benefit for me personally was to be able to see progress in my advocacy work on HIV-related travel restrictions in general, and those in place in South Korea in particular. After getting a late-breaker policy passed last year that specifically addressed the mandatory HIV testing policy for English teachers in South Korea and the UN CERD decision in response to its challenge, I was able to get a permanent policy proposal adopted by APHA's Governing Council with the enthusiastic support of multiple components, including the HIV/AIDS Section, the Epidemiology Section, and the LGBT Caucus of Public Health Professionals. (My component, the International Health Section, sponsored the policy.) While APHA has not yet taken official action on the basis of the policy, having the position statement in writing and publicly available is certainly progress, and I remain optimistic that the policy can be leveraged to inspire future action from both the organization and its members within. I also hope to be able to work with the World Federation of Public Health Associations to pass a similar policy that can then be used to inspire action from the Korean Public Health Association (which is a member of WFPHA). After two years of beating this particular drum, I have learned that advocacy can be slow and frustrating work. There is a lot of self-funded travel for opportunities to publicize your cause, and having metaphorical doors repeatedly shut in your face gets old after a while. After a draining four days in Denver I had begun to wonder if my work was making a dent in anyone's attention outside of my immediate circle of APHA colleagues. 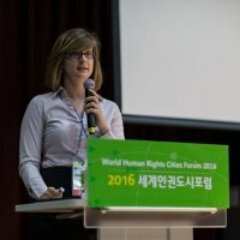 Imagine my pleasant surprise when I was contacted by This Morning with Alex Jensen, an English-language radio program in Seoul, requesting an interview on the topic of rising HIV rates in Korea because of the article I wrote for Humanosphere last December. It was broadcast on Monday morning in Seoul; a podcast of the interview is available for listening or download here. Obviously there is still a lot to do, but it is encouraging to see that this issue is finally getting some traction.